Manning, C., Morrison, B. R., & McIlroy, T. (2014). MOOCs in language education and professional teacher development: Possibilities and potential. Studies in Self-Access Learning Journal, 5(3), 294-308. Massive Open Online Courses (MOOCs) developed from the traditions of distance and self-access learning, and are growing in popularity. As a new and exciting area of education, the potential of MOOCs to transform education by allowing free access to courses for anyone with the access to technology and the internet has potential for teachers and learners to benefit from the courses offered. In this short article, three different perspectives on using MOOCs in educational contexts within Japan are discussed. The first describes a collaborative project in which one of the authors participated in a MOOC alongside a group of language learners. In the next, individual students pursuing self-directed language learning chose MOOCs to meet their various goals of knowledge and skill development as they prepared to study abroad. Finally, this article considers the role of MOOCs in professional teacher development through the reflections from a teacher participant. All three discussions relate their ideas to the themes of possibility and potential, while considering practical issues for language learners and educators. The development of online distance learning via Massive Open Online Courses (MOOCs) is an area of increasing interest for educators and learners. This recent innovation may even have a considerable impact on society in general, as “education and social equity are closely connected to issues of technology access, use, and mastery” (Warschauer, 2011, p. 21). This shift in education has come about through an increase in access to technology and from a will to increase access to education. The potential of MOOCs to transform education has arrived through a combination of perceived necessity and the increased access to technology (Friedman, 2012, Koller, 2012). The creation of MOOC platforms such as Coursera, Udacity, EdX and FutureLearn have enabled mass participation. For example, as of July 25, 2014, Coursera.org reported hosting 571 courses, with 22,232,448 total participants from 190 different countries (coursera, 2014). The most popular course, in Social Psychology from Wesleyan University in the US had over 250,000 participants in one cycle of teaching (Walters, 2014). MOOCs can therefore potentially have a greater impact on more students in one cycle of classes than the same professor teaching an entire career could hope to achieve. In many ways MOOCs can be considered as distance learning with added peer support and social networking. The integration of online forums offer possibilities for the emergence of learning communities to share experiences and common interests, or communities of practice (Wenger, 1991) where more knowledgeable participants help others develop skills and knowledge. This added interactivity provides potential assessment of learning through dialoguing (Sampson, 2003) and goes some way to make up for the lack of teacher-student interaction, partially addressing Kirkup and Jones’ (1996) assertion for distance education that, “Students need dialogue with their teachers and with other students in order to consolidate and check on their own learning” (p. 278). Other offline learning interactions may occur where the MOOC material is online, and distant, but support is provided locally from other students, a teacher, or another professional educator. There may be a role for using MOOCs for flipped learning whereby students develop their knowledge around a topic using MOOC content outside the classroom then come together in class to share their understanding and views, with the teacher facilitating the interactions, maintaining an appropriate group dynamic and introducing further issues and content as appropriate. Fisher (2012) discusses this using a single MOOC but it is also possible to incorporating content from various MOOCs as recommended by Bruff, Fisher, McEwen, and Smith (2013). The key variables for success are still being identified. For example, Lu’s (2010) research into computer-aided self-access learning found that for his learners, appropriate and timely student guidance was crucial to success, especially at the outset of the course. In this article, three perspectives are examined to identify potential pitfalls and successful approaches for developing communities of practice using MOOCs. Whether as an active student-participant, learning advisor or teacher, MOOCs open up exciting possibility and potential. In February 2013, a student at the University of Shimane earned the required TOEFL score necessary to study abroad at a state university in the United States. Before receiving this successful result, he had been solely focused on studying for the TOEFL test. Having fulfilled the language proficiency test requirement, he wanted to prepare to study abroad beginning in September 2013. He approached one of the authors, a language teacher at the University of Shimane, and expressed anxiety about his ability to pass an American lecture-style course and wanted to know how to best prepare. To determine if the student was prepared to study abroad, a diagnostic test was needed. However, it can sometimes be challenging to locate a suitable test, as Hughes (2003) points out, “The lack of good diagnostic tests is unfortunate. They could be extremely useful for individualised instruction or self-instruction” (p. 16). Fortunately, MOOCs have become easily accessible in recent years. Authentic lectures from a variety of countries can be freely accessed. This author suggested using a MOOC as a task-based diagnostic test, as it would bring attention to areas a student needs to develop, effectively determining what the student needs to learn (Brown & Abeywickrama, 2010). By passing or failing an American lecture course, the student should gain a reasonable measurement of his current ability to earn credit while studying abroad. Although participating in an online lecture series is an unusual choice for a diagnostic test and would require an extensive amount of time to complete, several benefits were apparent to offset the time commitment. First, the online quizzes and essays check for comprehension and would give the student more feedback than simply watching a presentation, such as those found on TEDtalks. In addition to helping this student the become aware of his own strengths and weaknesses, participating in a MOOC would also enable him to set goals, make a learning plan, and use his time more effectively to prepare to study abroad. As the MOOC progressed over several weeks, it would allow chances for the student to adjust his plan and develop new learning strategies. This experience would serve as a diagnostic test and a practical training exercise. To measure our English abilities against what they need to be to study abroad successfully. To prepare for lectures aimed at native English speakers by taking authentic lectures. To develop learning strategies to enhance our understanding of the material. To learn about interesting and useful topics not offered at our University. To maintain our English abilities after returning from studying abroad. The students chose an upcoming MOOC from Coursera.org titled “Inspiring Leadership through Emotional Intelligence”. It was a 6-week course, which recommended five to six hours of study time per week for native English speakers. In addition to studying online, the students set up face-to-face weekly study sessions to share progress and seek help. The author also signed up for the course, but encouraged students to help each other before asking for support. One of the immediate difficulties students encountered was the reading assignments. Given that Japanese secondary schools emphasize reading comprehension, this was unexpected. The students attempted to read the lecture notes, the required reading, and the recommended reading. This took a long time, especially since the recommended reading included in-depth background information, such as influential research articles from academic journals. As a result of this experience, students learned to prioritize their reading. They spent more time working to comprehend the lecture notes, a shorter amount of time skimming the required reading, and skipped the recommended reading completely. They also noticed that key points were often summarized in the chapter conclusions. They started reading those first. The online course format was another initial challenge for students because it was new to them. Some of the courses at the University of Shimane have websites, but they are organized differently. The student that studied abroad previously was more familiar with the format. He explored the course site more quickly and gave the other students a tutorial on how to navigate the site. During the weekly face-to-face study sessions, the students were able to compare notes and review the key points. This cooperative study strategy identified misunderstandings and provided chances for peer support. All of the students had some difficulty understanding specialized academic vocabulary, but were able to understand the overall meaning of the lectures when viewed at regular speed. This was surprising for the students and the teacher, as understanding the lectures would have been an assumed weakness prior to this diagnostic activity. The biggest challenge encountered by students, however, was the time requirement. For them, it took more than five to six hours per week. With full course loads, homework, and part-time jobs in the evenings, it was too much to keep up with. After three weeks, five students had to stop to focus on more urgent responsibilities. The other two lost motivation when their friends quit. Nevertheless, in three weeks, the students were able to identify some of their strengths and weaknesses, as well as develop a few new learning strategies prior to studying abroad. It is worth briefly noting here that Coursera.org offers other courses that require less time, as little as one hour per week for native speakers, but none were offered at that time. In March 2014, about seven months into the students’ year abroad, this author toured the various American campuses accepting University of Simane students. During the tour, he asked students who had participated in the Lecture Ready circle prior to studying abroad if the MOOC experience was worth repeating. Of the five students interviewed, two recommended that the MOOC activity continue in the future. They said becoming familiar with the website format was very useful because it was almost identical to their courses in the US. Some of their lectures are even delivered live over the Internet, instead of in person to accommodate more students in one class. They also said that the reading strategies and cooperative learning strategies were very useful as well. They sought out study groups for each class and even made themselves available as tutors for American students learning Japanese. The other three students said that it was an interesting experience, but that their time would have been used more effectively studying for the TOEFL test. At that time, these three students were enrolled in a preparatory ESL program, attempting to improve their TOEFL score and gain admittance to regular university courses. Although none of the students completed the MOOC before going abroad, the three-week experience was a useful diagnostic test to identify the students’ strengths and weaknesses. It also provided opportunities to develop effective coping strategies before studying abroad. From follow-up interviews, it seems that perhaps the perceived value of practicing with MOOCs heavily depends on whether the student has earned the mandatory language proficiency test score. When the students return in August 2014, it will be interesting to see if any of them start up the Lecture Ready circle again to maintain their English abilities. Kanda University of International Studies (KUIS) specializes in language teaching and learning. The cross-department English Language Institute classes are delivered in English, and outside the classroom the self-access centre (SAC) offers resources and pedagogic support for students’ self-directed language learning goals. This support includes opportunities for students to take structured self-directed language learning (SDLL) courses (for more details see Noguchi & McCarthy, (2010) and Morrison (2011)). In 2013 MOOCs were chosen for the first time as resources for SDLL at KUIS. While the number of students was limited (three), their experiences provide an insight into how to offer appropriate support for future MOOC-using students. The students gave permission for this author to analyse learning logs or agreed to an interview in order to support this small on-going action research project, which aims to investigate the viability and sustainability of MOOCs as a self-access learning resource in the context of this university. These three students had a common objective, to study overseas, and had all initially spent months on SDLL to increase their IELTS scores; however, they were learning independently of each other as their SDLL support occurred at different times in the academic year. Once they had achieved their IELTS requirements, they all returned seeking ideas for further developing their English that would enable them to cope more effectively with their future academic lives. It was at this stage that each student was told about MOOCs during an advising session and shown how to search for courses by her Learning Advisor (LA). All three subsequently accessed these courses to develop specific aspects of their knowledge and skills they identified as requiring development. In contexts such as this, MOOCs can be used for their intended purpose – to develop knowledge – as well as providing opportunities to practice the skills required for overseas participation at tertiary level. For example, MOOCs provide access to English language lectures, a format lacking in Communicative Language Teaching and a classroom format rare enough at KUIS for the three students in this study never to have experienced; nevertheless, these are a common medium of content delivery on undergraduate courses in English-medium universities. Through MOOCs, students therefore have a chance to extend their knowledge in English prior to embarking on their overseas studies as well as developing the strategies and skills to cope with knowledge/language input. 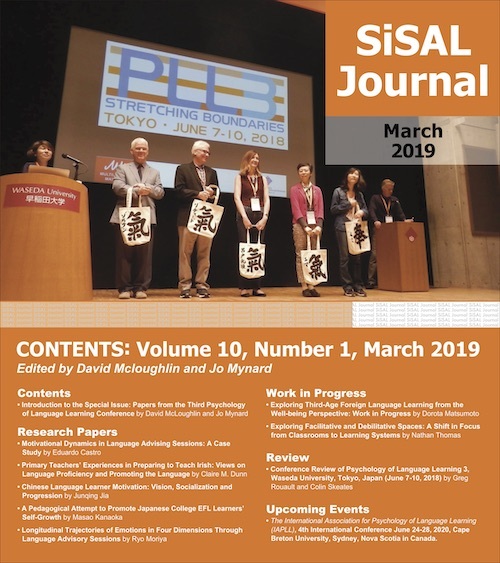 The pedagogic support and resources to facilitate this could come from the teacher and peers as outlined in the previous section at the University of Shimane, or through a SAC as described here. The experiences of the first three students to use MOOCs gives an indication of the possible support and resources that could facilitate MOOC use. Student A originally booked a 1-to-1 session with an LA to make and implement learning plans which would develop her reading and listening skills for IELTS. She had three sessions over the semester. Having achieved her desired score and raising her IELTS 6.0 to 6.5, she returned the following semester seeking ideas to develop her skills for listening and note taking, which she perceived were inadequate for coping with academic life overseas. She enrolled on a self-directed learning module (SDLM) and with her LA created a learning plan and study schedule to complete over eight weeks. She chose an introductory course to business finance – a topic related to her study abroad choice. At the time, the LA and student were only aware of the Coursera.org platform for MOOCs, which has courses with specific start dates. She had to wait a month to start the course and in the meantime use TED to practise listening and note taking. It was clear in her weekly reflections that she found this frustrating and was keen to move onto the course. Student C reserved seven advising sessions and used SDLL and SAC support to raising her IELTS score from 4.5 to 6.0 over two semesters. At the end of the second semester, she approached her LA for ideas to strengthen her preparedness for overseas study during the 10-week break between semesters. She was particularly keen to develop her subject knowledge for her overseas course and her vocabulary for this using receptive skills. She took a MOOC on Communication Studies, a subject she had studied previously in Japanese with an open start date and no deadlines. After the summer break, she took part in a semi-structured interview. Although she had planned to follow the whole MOOC course over the vacation, she had only done three lessons. Nevertheless, she said her experience had been positive and she would recommend it to other students in her position. She felt that the listening had done more to reinforce lexis previously learned in the classroom than to teach her new vocabulary. Using MOOCs for language learning and skills development goes beyond the original aims of these resources. While the small student sample does not allow for generalisations, their experiences provide an insight into the support language educators may need to consider for MOOCs to be more widely used with this demographic. The initial support offered by teachers or SACs could include learner training in listening to lectures and note taking using graded lecture material or lecture strategy worksheets to prepare students to use or scaffold authentic material while providing learner training in EAP strategies. Other support students could look for before choosing includes glossaries, lecture transcripts, subtitles and pre-reading texts. Raising awareness of these options can help students make more informed choices when selecting a MOOC. When students are prepared and have chosen a course, ongoing support as the MOOC progresses should be considered. The support could come through peers if students can be encouraged to work together on a course, through a teacher who participates and guides discussion groups, or through SAC educators who guide students to reflect on and modify their learning to suit the situation. Online tools such as academic word list highlighters, vocabulary frequency checkers and mindmapping tools can be introduced when appropriate. Through preparation, informed choice and support, at least at the beginning of the course, MOOCs have the potential to develop the knowledge, skills and language of language learners. In 2013, during two teaching semesters at Kanda University of International Studies (KUIS) the author signed up for participation in several MOOCs as a form of teacher professional development (PD). Some typical examples of PD for teachers are a) in-house teacher training b) workshops and meetings c) small group projects and d) professional teaching portfolios. PD is sometimes compulsory while sometimes is opt-in. Many teachers would argue that opt-in PD which meets institutional and personal goals while being flexible enough to cater to the busy teaching schedule is the ideal model for PD. MOOC participation is voluntary and opt-in, and, importantly allows participants to “negotiate the extent and nature of their participation” (McAuley, Stewart, Siemens, & Cormier, 2010, p. 5) while potentially providing added peer support and opportunities for social networking. In the first semester of 2013, the author investigated and signed up for several general courses from Coursera.org. At this time the author had curiosity for participation in MOOCs in general. The first was titled “Critical thinking in global challenges” which aimed to be cross-curricular. Although this MOOC contained general content related to education it seemed at times to have only limited application to the author’s specific educational setting. For this course the certificate of completion was not attempted, and because of limited enthusiasm with the course materials the course was not completed. Finding suitable topics appears to be an important step in successful PD using MOOCs. A second general education course was “E-learning and digital cultures” which investigated a number of options for integrating technology in different educational settings. The final project was a digital artefact, which could be created using a range of media. This was resulted in some impressive contributions from hundreds of participants. Each course had an online forum, as well as opportunities to meet up with other MOOC participants locally if desired. Participation, even minimal participation, in a MOOC can be seen as being a “legitimate peripheral participant” (Wenger, 1991). The options for participation in this course had a flexible, creative structure but still required submission of peer-assessed work through regular deadlines. The author interacted with course materials and participated in forums without submitting final assignments, thereby learning from peers on the course as well as from course lectures. The main reason for non-completion of some assessed tasks was time constraints. Another reason was a feeling of being curious about the course content, while at the same time feeling limited drive to complete the course fully. This challenge is one of the most significant for any teacher participating in PD outside of regular working hours. As this participation was optional it was challenging to build up momentum to complete assignments and so a certificate of accomplishment was not achieved for this course. In the second half of the academic year the author attempted MOOC participation to a greater degree. Motivated by three clear aims the author sought to 1) find out more about education and literature 2) glean ideas for course organisation and readings and 3) use this motivation to integrate technology into curriculum design. Experience on the previous semester’s MOOCs resulted in a move towards more highly content-specific MOOCs, in this case literature courses. In this semester the author completed two literature courses gaining certificates of accomplishment for both. First was “The Fiction of Relationship”, a 10 week course with essay submissions and peer feedback, which required reading a novel per week. This course included a creative writing as an option to vary from the regular essay format. Additional material was provided via videos of on-campus student groups participating in small group discussions on the topics. This course felt very close to the experience of being at university, studying literature, and focusing on a new book each week while exploring a shared theme. In addition, the familiarity of the course design helped understanding of the course goals and expectations. One positive result of taking this course was the integration of the creative assessment format into a KUIS language curriculum in 2014. A second literature course, with equally fast-paced content was “Fantasy and science fiction: The human mind, our modern world”. This course was highly successful in making connections between the readings and the world outside the text. The goals of the course were aligned well with the author’s own goals for literature education. The selection of texts was wide-ranging and challenging, while the pace of discussion worked in tandem with the theme. Many participants expressed their desire to attempt other MOOCs with similar content, or expressed gratitude to the professor at the end of the course via online forums. The added interactivity of the peer-reviewed assignment feedback was encouraging and motivating. Submitting work for deadlines, reading peer-feedback on essays and being graded by anonymous participants can be challenging, though achievement of course objectives was satisfying. The potential for motivation and encouraging greater task completion through online learning seemed most possible with this engaging MOOC. Through participating in MOOCs, teachers can find opportunities for PD which are aligned with their own teaching and learning goals. Fresh ideas for classes and tasks can be integrated into learning programmes after learning from MOOCs not only from the course content but also from the networking and discussions in peer support. Potentially, a MOOC on creativity could be useful to teachers and institutions focused on developing programmes of learning, for example. Teachers can also feel more connected to others outside their institutions through participation in MOOCs. For instance, in the “E-learning and digital cultures” MOOC, over 42,000 people participated in the class Google Hangout. This not only gives an insight into the market for MOOCs but also suggests the potential for collaboration and cooperation with colleagues overseas. Curriculum designers, lead teachers and education managers could investigate the growing influence of MOOCs as distance learning opportunities for PD continue to evolve. Potentially teachers could participate in MOOCs to learn from the vast wealth of educational contexts represented by these global participants. Preparing for study abroad, which is not based on language exams. Learning with authentic materials such as lectures and academic texts. Developing knowledge, including introductory courses. Language support through subtitled video & written materials. Supporting knowledge development through participant forums. Connecting with a larger educational community outside the workplace. For English language learners keen to study an English-medium course, MOOCs offer authentic material and have potential as a preparatory resource for overseas study. Educators wishing to continue their own professional education outside the classroom can use MOOCs in a flexible way which fits their work commitments. Brian R. Morrison, co-author of The Autonomy Approach, has taught in various countries from Macedonia to Equatorial Guinea. He currently works at a private university in Japan as a Learning Advisor guiding learners towards their goals. Tara McIlroy holds an MA in Applied Linguistics from Victoria University in Wellington, NZ, and is currently a PhD candidate at the University of Birmingham, UK. Her research interests include literature in the language classroom and distance learning. Brown, H. D., & Abeywickrama, P. (2010). Language assessment. Principles and classroom practices (2nd ed.). White Plains, NY: Pearson Education. Hughes, A. (2003). Testing for language teachers (2nd ed.). Cambridge, UK: Cambridge University Press. Kirkup, G., & Jones, A. (1996). New technologies for open learning: The superhighway to the learning society? In P. Raggatt, R. Edwards & N. Small (Eds. ), Adult learners, education and training 2: The learning society: Challenges and trends (pp. 272-291). London, UK: Routledge. Sarosy, P., & Sherak, K. (2006) Lecture ready 1: Strategies for academic listening, note-taking, and discussion. Oxford, UK: Oxford University Press. Warschauer, M. (2011). Learning in the cloud. New York, NY: Teachers College Press. Wenger, E. (1991). Communities of practice. New York, NY: Cambridge University Press.